NOAO, the Giant Magellan Telescope (GMT) Organization, and the Thirty Meter Telescope (TMT) International Observatory, are continuing our joint effort to develop a US Extremely Large Telescope (ELT) Program. Our primary goal is to enable forefront research by the broad US astronomical community via open access to significant shares of observing time with both TMT and GMT. In the coming decade, ELTs with 20-m to 40-m primary mirror diameters will peer out into the Universe with unprecedented sensitivity and angular resolution, enabling scientific investigations beyond the reach of present-day observatories, in nearly all fields of astronomical research from our Solar System to cosmology. The combination of TMT and GMT provides access to both hemispheres and more diverse observing capabilities, enabling integrated science programs that go beyond the reach of a single facility. More than 250 astronomers are currently working together to develop concepts for Key Science Programs (KSPs) using TMT and GMT. KSPs will address questions of fundamental scientific importance that may require tens to hundreds of observing nights with GMT, TMT, or both observatories working in concert, taking advantage of their combined view of the full sky, or of their complementary instrumental capabilities. It is envisioned that KSPs will follow open collaboration models that encourage broad, diverse participation by observers, theorists, and data scientists throughout the US community. More than 85 scientists will gather in Tucson for a KSP Development Workshop in mid-November. If you would like to contribute to KSP development, please register using the on-line form. Site excavation for the GMT’s concrete pier and enclosure began at Las Campanas Observatory in August, and is expected to take about five months to complete. The Supreme Court of the State of Hawai’i has upheld an earlier decision by the State Board of Land and Natural Resources to issue a Conservation District Use Permit for the construction of TMT on Maunakea. NOAO is the US national research & development center for ground-based night time astronomy. In particular, NOAO is enabling the development of the US optical-infrared (O/IR) System, an alliance of public and private observatories allied for excellence in scientific research, education and public outreach. Our core mission is to provide public access to qualified professional researchers via peer-review to forefront scientific capabilities on telescopes operated by NOAO as well as other telescopes throughout the O/IR System. Today, these telescopes range in aperture size from 2-m to 10-m. NOAO is participating in the development of telescopes with aperture sizes of 20-m and larger as well as a unique 8-m telescope that will make a 10-year movie of the Southern sky. In support of this mission, NOAO is engaged in programs to develop the next generation of telescopes, instruments, and software tools necessary to enable exploration and investigation through the observable Universe, from planets orbiting other stars to the most distant galaxies in the Universe. To communicate the excitement of such world-class scientific research and technology development, NOAO has developed a nationally recognized Education and Public Outreach program. The main goals of the NOAO EPO program are to inspire young people to become explorers in science and research-based technology, and to reach out to groups and individuals who have been historically under-represented in the physics and astronomy science enterprise. The National Optical Astronomy Observatory is proud to be a US National Node in the International Year of Astronomy, 2009. Kitt Peak National Observatory (KPNO) has its headquarters in Tucson and operates the Mayall 4-meter, the 3.5-meter WIYN , the 2.1-meter and Coudé Feed, and the 0.9-meter telescopes on Kitt Peak Mountain, about 55 miles southwest of the city. The Cerro Tololo Inter-American Observatory (CTIO) is located in northern Chile. CTIO operates the 4-meter, 1.5-meter, 0.9-meter, and Curtis Schmidt telescopes at this site. 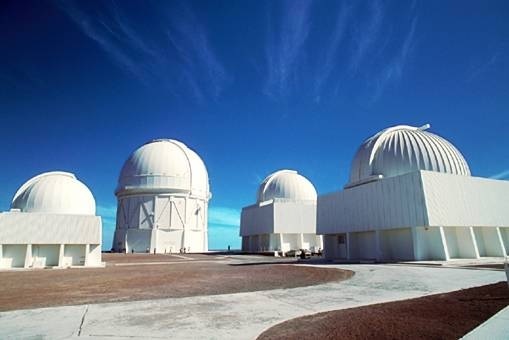 The NOAO System Science Center (NSSC) at NOAO is the gateway for the U.S. astronomical community to the International Gemini Project: twin 8.1 meter telescopes in Hawaii and Chile that provide unprecendented coverage (northern and southern skies) and details of our universe. NOAO is managed by the Association of Universities for Research in Astronomy under a Cooperative Agreement with the National Science Foundation. Our immediate task is advocacy for frontier research programs led by U.S community scientists that can achieve exceptional advancements in humanity’s understanding of the cosmos. Our audience is the U.S. research community as represented by the upcoming Decadal Survey of Astronomy and Astrophysics (an enterprise of the U.S. National Academies). As an essential part of that immediate task, we will work with the U.S. research community to develop exemplar Key Science Programs (KSPs) within major research areas including the dark universe, first stars & first galaxies, exoplanet atmospheres, the surfaces of satellites and other small bodies throughout Solar System, and/or other topics to be proposed and prioritized by community-based working groups. Key Science Programs are envisioned to be open collaborations that gather observers, theorists, and data scientists together to exploit significant investments of Thirty Meter Telescope (TMT) and Giant Magellan Telescope (GMT) observing time, from tens to hundreds of nights. Some of these collaborations are expected to be international in nature. If well-justified by KSP plans, we envisage that at least 25% of the observing time at each international observatory will be available for the U.S. community. The KSPs chosen for presentation to the Decadal Survey will not be the final programs. Astronomy and astrophysics will continue to evolve rapidly during construction of GMT and TMT, thanks to previous investments in ground– and space-based observatories, such as the NASA Transiting Exoplanet Survey Satellite (TESS), the NASA James Webb Space Telescope (JWST), and the Large Synoptic Survey Telescope (LSST). Actual KSPs will be selected by peer-review before the start of GMT and TMT science operations. NOAO, TIO, and GMTO are committed to enabling diversity within KSP collaborations. We seek to empower the best minds, no matter their gender, ethnicity, sexual orientation, or institutional affiliation. More information about the U.S. ELT Program and how community scientists can join KSP development groups will be available after mid-June 2018. One of astronomy’s most iconic sights in an artifact of faulty optics. Here’s how a new, great design will overcome it. When you look out at the greatest images of the Universe, there are a few sights that light up our memories and fire our imaginations. We can see the planets in our own Solar System to incredible detail, galaxies lying millions or even billions of light years away, nebulae where new stars are being birthed, and stellar remnants that give an eerie, fatalistic look into our cosmic past and our own Solar System’s future. But the most common sight of all are stars, lying everywhere and in any direction we care to look, both in our own Milky Way and beyond. From ground-based telescopes to Hubble, stars almost always come with spikes on them: an image artifact due to how telescopes are constructed. As we prepare for the next generation of telescopes, however, one of them — the 25-meter Giant Magellan Telescope — stands out: it’s the only one that won’t have those artificial spikes. There are a lot of ways to make a telescope; in principle, all you need to do is collect-and-focus light from the Universe onto a single plane. Early telescopes were built on the concept of a refractor, where the incoming light passes through a large lens, focusing it down to a single point, where it can then be projected onto an eye, a photographic plate, or (in more modern fashion) a digital imaging system. But refractors are limited, fundamentally, by how large you can physically build a lens to the necessary quality. 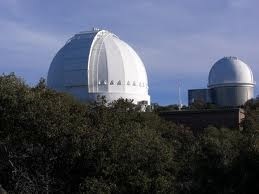 These telescopes barely top 1 meter in diameter, at maximum. Since the quality of what you can see is determined by the diameter of your aperture, both in terms of resolution and light-gathering power, refractors fell out of fashion over 100 years ago. But a different design — the reflecting telescope — can be far more powerful. With a highly reflective surface, a properly shaped mirror can focus incoming light onto a single point, and mirrors can be created, cast and polished to much greater sizes than lenses can. The largest single-mirror reflectors can be up to a whopping 8-meters in diameter, while segmented mirror designs can go even larger. At present, the segmented Gran Telescopio Canarias, with a 10.4 meter diameter, is the largest in the world, but two (and potentially three [TMT Thirty Meter Telescope now approved for Mauna Kea, Hawaii, USA4,207 meters (13,802 ft) above sea level ]) telescopes will break that record in the coming decade: the 25-meter Giant Magellan Telescope (GMT) at Las Campanas Observatory, Altitude 2,516 m (8,255 ft) and the 39-meter Extremely Large Telescope (ELT) on top of Cerro Armazones in the Atacama Desert of northern Chile, at an altitude 3,046 m (9,993 ft). and a scheduled completion date by the end of 2025. That’s soon! But even with that ambitious schedule, there’s one huge optical advantage that GMT has, not only over the ELT, but over all reflactors: it won’t have diffraction spikes on its stars. These spikes that you’re used to seeing, from observatories like Hubble, come about not from the primary mirror itself, but from the fact that there needs to be another set of reflections that focus the light onto its final destination. When you focus that reflected light, however, you need some way to place-and-support a secondary mirror to refocus that light onto its final destination. There’s simply no way to avoid having supports to hold that secondary mirror, and those supports will get in the way of the light. The number and the arrangement of the supports for the secondary mirror determine the number of spikes — four for Hubble, six for James Webb — you’ll see on all of your images. All ground-based reflectors have these diffraction spikes, and so will the ELT. The gaps between the 798 mirrors, despite making up just 1% of the surface area, contribute to the magnitude of the spikes. Whenever you image something faint that unluckily happens to be near something close and bright — like a star — you have these diffraction spikes to contend with. Even by using shear imaging, which takes two almost-identical images that are only slightly mis-positioned and subtract them, you can’t get rid of those spikes entirely. But with seven enormous, 8-meter diameter mirrors arranged with one central core and six symmetrically-positioned circles surrounding it, the GMT is brilliantly designed to eliminate these diffraction spikes. These six outer mirrors, the way they’re arranged, allows for six very small, narrow gaps that extend from the edge of the collecting area all the way into the central mirror. There are multiple “spider arms” that hold the secondary mirror in place, but each arm is precisely positioned to run exactly in between those mirror gaps. Because the arms don’t block any of the light that’s used by the outer mirrors, there are no spikes at all. Instead, owing to this unique design — including the gaps between the different mirrors and the spider arms crossing the central primary mirror — there’s a new set of artifacts: a set of circular beads that appear along ring-like paths (known as Airy rings) surrounding each star. These beads will appear as empty spots in the image, and are inevitable based on this design whenever you look. However, these beads are low-amplitude and are only instantaneous; as the sky and the telescope rotate over the course of a night, these beads will be filled in as a long-exposure image is accumulated. After about 15 minutes, a duration that practically every image should attain, those beads will be completely filled in. The net result is that we’ll have our first world-class telescope that will be able to see stars exactly as they are: with no diffraction spikes around them! There is a slight trade-off in the design to achieve this goal, the biggest of which is that you lose a little bit of light-gathering power. Whereas the end-to-end diameter of the GMT, as designed, is 25.4 meters, you “only” have a collecting area that corresponds to a 22.5 meter diameter. The slight loss of resolution and light-gathering power, however, is more than made up for when you consider what this telescope can do that places it apart from all others. It will achieve resolutions of between 6–10 milli-arc-seconds, depending on what wavelength you look at: 10 times as good as what Hubble can see, at speeds 100 times as fast. Distant galaxies will be imaged out to distances of ten billion light years, where we can measure their rotation curves, look for signatures of mergers, measure galactic outflows, look for star formation regions and ionization signatures. We can directly image Earth-like exoplanets, including Proxima b, out to somewhere between 15–30 light years distant. Jupiter-like planets will be visible out to more like 300 light years. We’ll also measure the intergalactic medium and the elemental abundances of matter everywhere we look. We’ll find the earliest supermassive black holes. And we’ll make direct, spectroscopic measurements of individual stars in crowded clusters and environments, probe the substructure of nearby galaxies, and observe close-in binary, trinary and multi-star systems. This even includes stars in the galactic center, located some 25,000 light years away. All, of course, without diffraction spikes. Compared to what we can presently see with the world’s greatest observatories, the next generation of ground-based telescopes will open up a slew of new frontiers that will peel back the veil of mystery that enshrouds the unseen Universe. In addition to planets, stars, gas, plasma, black holes, galaxies, and nebulae, we’ll be looking for objects and phenomena that we’ve never seen before. Until we look, we have no way of knowing exactly what wonders the Universe has waiting for us. Owing to the clever and innovative design of the Giant Magellan Telescope, however, the objects we’ve missed due to diffraction spikes of bright, nearby stars will suddenly be revealed. There’s a whole new Universe to be observed, and this one, unique telescope will reveal what no one else can see. The last piece of glass is placed into the mold for GMT mirror 5. No image credit. “The Giant Magellan Telescope Organization (GMTO) today announced that it has initiated the casting of the fifth of seven mirrors that will form the heart of the Giant Magellan Telescope (GMT). The mirror is being cast at the University of Arizona’s Richard F. Caris Mirror Laboratory, the facility known for creating the world’s largest mirrors for astronomy. The nearly 25-meter diameter GMT will be sited in the Chilean Andes and will be used to study planets around other stars and to look back to the time when the first galaxies formed. The process of “casting” the giant mirror involves melting nearly 20 tons of glass in a spinning furnace. Once cooled, the glass disk will be polished to its final shape using state-of-the-art technology. The GMT will combine the light from seven of these 8.4-meter mirrors to create a telescope with an effective aperture 24.5 meters in diameter (80 feet). With its unique design, the GMT will produce images that are 10 times sharper than those from the Hubble Space Telescope in the infrared region of the spectrum. Harvard University and the Smithsonian Institution are both members of the GMT project. Other members include Astronomy Australia Ltd., the Australian National University, the Carnegie Institution for Science, the Korea Astronomy and Space Science Institute, the São Paulo Research Foundation, the University of Texas at Austin, Texas A&M University, the University of Arizona, and the University of Chicago. The GMT primary mirrors are made at the University of Arizona’s (UA) Steward Observatory Mirror Lab in Tucson. Each of GMT’s light-weighted mirrors is a marvel of engineering. The mirrors begin as pristine blocks of custom manufactured low-expansion E6 glass from the Ohara Corporation of Japan. Precisely 17,481 kg of these glass blocks have been placed by hand into a custom-built furnace pre-loaded with a hexagonal mold. At the peak of the lengthy casting process, in which the giant furnace spins at up to five revolutions per minute, the glass is heated to 1165°C (2129°F) for about four hours until it liquefies and flows into the mold. The casting process continues as the glass is carefully cooled for three months while the furnace spins at a slower rate. The glass then undergoes an extended period of shaping and polishing. The result of this high-precision process is a mirror that is polished to an accuracy of one twentieth of a wavelength of light, or less than one thousandth of the width of a human hair. With its casting this weekend, the fifth GMT mirror joins three additional GMT mirrors at various stages of production in the Mirror Lab. Polishing of mirror 2’s front surface is well underway; coarse grinding will begin on the front of the third mirror shortly and mirror number 4, the central mirror, will soon be ready for coarse grinding following mirror 3. The first GMT mirror was completed several years ago and was moved to a storage location in Tucson this September, awaiting the next stage of its journey to Chile. The glass for mirror 6 has been delivered to Tucson and mirror seven’s glass is on order from the Ohara factory in Japan. In time, the giant mirrors will be transported to GMT’s future home in the Chilean Andes at the Carnegie Institution for Science’s Las Campanas Observatory. This site is known for being one of the best astronomical sites on the planet with its clear, dark skies and stable airflow producing exceptionally sharp images. GMTO has broken ground in Chile and has developed the infrastructure on the site needed to support construction activities. 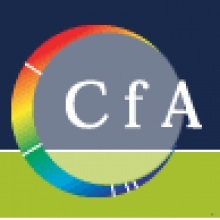 Received via email from CfA. See the full article from GMT here. The Center for Astrophysics combines the resources and research facilities of the Harvard College Observatory and the Smithsonian Astrophysical Observatory under a single director to pursue studies of those basic physical processes that determine the nature and evolution of the universe. 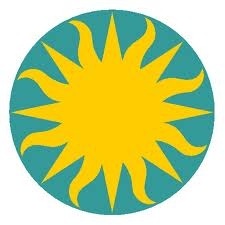 The Smithsonian Astrophysical Observatory (SAO) is a bureau of the Smithsonian Institution, founded in 1890. 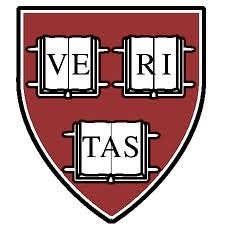 The Harvard College Observatory (HCO), founded in 1839, is a research institution of the Faculty of Arts and Sciences, Harvard University, and provides facilities and substantial other support for teaching activities of the Department of Astronomy. The Giant Magellan Telescope will be one of the next class of super giant earth-based telescopes that promises to revolutionize our view and understanding of the universe. It will be operational in about 10 years and will be located in Chile. The Giant Magellan Telescope (GMT) is a ground-based extremely large telescope under construction, planned for completion in 2025. The location of the telescope is Las Campanas Observatory. The project is US-led in partnership with Australia, Brazil, and Korea, with Chile as the host country. The following organizations are members of the consortium developing the telescope. The GMT has a unique design that offers several advantages. It is a segmented mirror telescope that employs seven of today’s largest stiff monolith mirrors as segments. Six off-axis 8.4 meter or 27-foot segments surround a central on-axis segment, forming a single optical surface with an aperture of 24.5 meters, or 80 feet in diameter. The GMT will have a resolving power 10 times greater than the Hubble Space Telescope. The GMT project is the work of a distinguished international consortium of leading universities and science institutions.